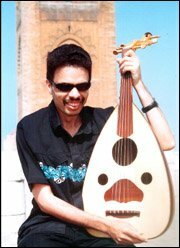 Composer Azzedine Ouhnine, a Moroccan “Stevie Wonder”, stirred many souls when blending Moroccan music with Techno and Rap. He was born on October 1, 1967 in Salé. This talented musician, who spoke only Berber at the time, decided to learn Arabic, then French. Languages inspired him to discover more the culture of the others. “Learning languages helped me a lot in my career. It gave me the inspiration and the desire to reflect the principles of cultural dialogue and tolerance in my works of art,” said Azzedine Ouhnine. School cultural activities helped him face a large public for the first time. He decided, then, to join the National Conservatory of Music and Dance. He also became a member of the Rabat Choral, under the leadership of Louis Péraudin. He took up the challenge of blindness by studying social and psychological sciences at the university. His studies at the department of philosophy motivated him to create The Ouhnine Group for Sounds and Music. “The objective of the band was to reincarnate our musical heritage but with a new vision,” he explained. Ouhnine eventually realized his dream when he produced, in 2004, his new and special Album “Masafat” (Bridges), with the collaboration of the New York-based producer, bassist and visionary, Bill Laswell. Laswell is responsible for some of the most interesting and influential recordings of the last 20 years. Unlike other sonic architects, he has no rulebook or pre-defined codes. Rather, Laswell works largely from instinct, which calls for fusing rock with tablas and reggae, ambience with noise, jazz with Moroccan trance music or all of the above. “The Album clearly illustrates the idea of cultural dialogue. I wanted to make Moroccan music more known outside by mixing it with foreign sounds,” said Ouhnine. In his Album, Ouhnine mixed different Moroccan sounds including Berber, Sahrawi, and popular Moroccan music with Techno and Rap. Through these mixes, Ouhnine hopes to satisfy the needs of young people who are always eager for any new musical trend. “It was called “Masafat” because it aims at bridging distances between Moroccan and foreign composers, and blending Moroccan music with other different sounds,” said Ouhnine. The Album was recorded at Sama Master, Casablanca, and at Orange Music in New Jersey. Ouhnine has a forthcoming collaboration with Arabic poet Inas Rachid Zahrani. The project is composed of 20 songs of which 15 will be sung in Egyptian, four in Arabic (Khaliji), and one in Moroccan Arabic. According to Ouhnine, they will be sung by prominent Arab singers.